Shown above is a skeleton view revealing the inside support. 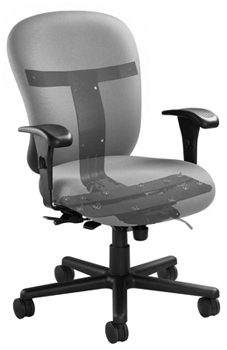 Overall dimensions of the chair: 27" wide, 27" deep, 37 1/2" - 42 1/2" high without headrest. With Headrest: 45 1/2" - 52" high, seat height 16"-21". This product features oversized 3" dual wheel carpet casters and is available in black only.